The Dyson AM07’s futuristic, bladeless technology landed it as the number 1 choice on our list. The Vornado 184 is built to circulate air through it’s angled louvers so it can cool off even the biggest living rooms. You won’t even notice this uber-quiet Honeywell tower fan is on. Enjoy a cool breeze or cool down your bedroom with this versatile Honeywell tower fan. This sleek Lasko tower fan will add a cool design and comfort to your home, for a great price. Summer is fast approaching and for many, that means back to back months of being uncomfortable, sweaty and miserable in your own home. Whether you don’t want to run up your bill using the AC or you simply need something to keep you cool during the day, investing in a tower fan could be a lifesaver. Nowadays, the best tower fan can go above and beyond just keeping you cool. A tower fan can dramatically increase your comfort during the hot months and the best part- it can help lower those steep electricity bills down. Since there are so many out there, we’re taking a look at some of the best tower fans and what you should look for when shopping for one. There are tons of great tower fans to choose from, but when it came to choosing the best one, we couldn’t resist the Dyson AM07. The Dyson is not only an excellent cooling system that circulates cool air in a room quickly, but it also has the most innovative design out of all of them. The Dyson AM07 works as an air multiplier by reproducing the air in a room through its bladeless system. This powerful fan can instantly cool off an entire room and it does it without oscillating or without the traditional blades. This makes for a sleek design as well as a child and pet-safe option for your home. Choose from over 10 different settings to customize it to your liking. This fan is also one of the more silent fans since it doesn’t have blades. 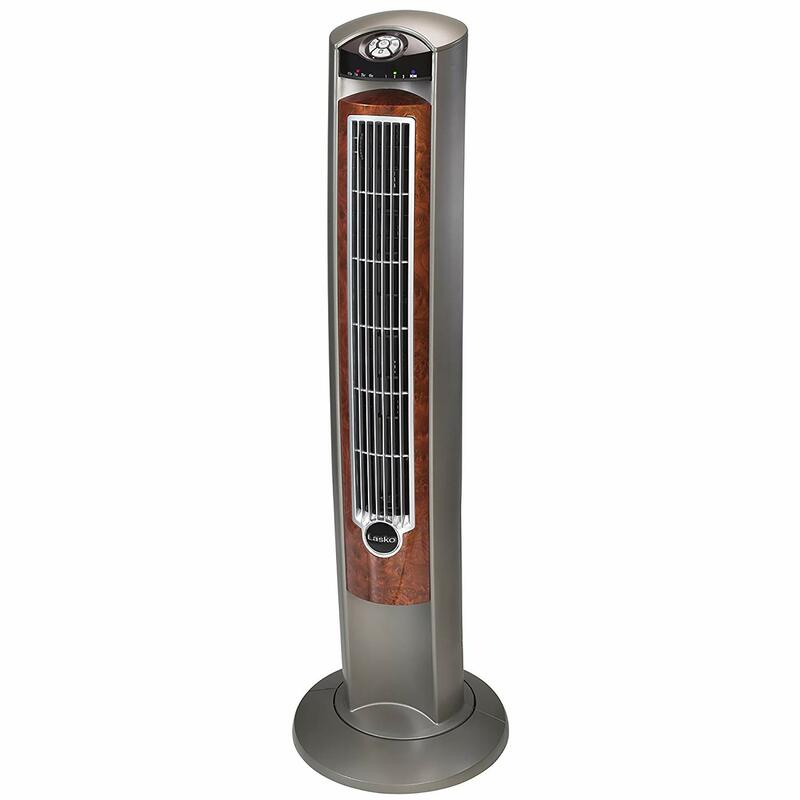 If you want to splurge on a luxury tower fan that gets the job done, this is one of our top choices. Bladeless system: The innovative bladeless system is safe for pets and children. Quiet: Due to the bladeless design, this fan is pretty quiet compared to most tower fans. Powerful airflow: This fan creates a powerful constant flow of air that will instantly cool down a room. Expensive: You’re going to have to fork over a couple of hundreds for this one, it’s the most expensive fan on our list. 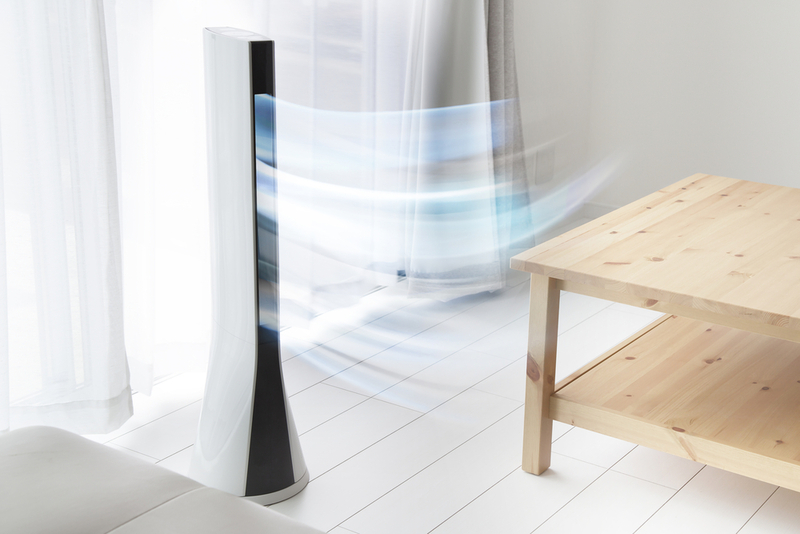 The Lasko Wind Curve Tower is designed to rapidly cool off any room. This is our top choice for someone looking for an affordable, stylish and versatile fan for their home. The unique wood panel design could add a nice touch to any room in your home. You can also choose from three different settings and tailor it to your liking. We chose this tower fan for its spectacular performance and the great price. The Lasko T49250 definitely won’t disappoint. Unique stylish design: This fan has a unique, wood-paneled design that could add some spark to your home decor. Performs well: Simple, easy to use design and three different settings to choose from. Can fit in any room: The fan has an easy to grip bottom so that it can fit on several types of floors without slipping. Limited placement: Because this unit has a short cord, it may be difficult to place this in some spaces. 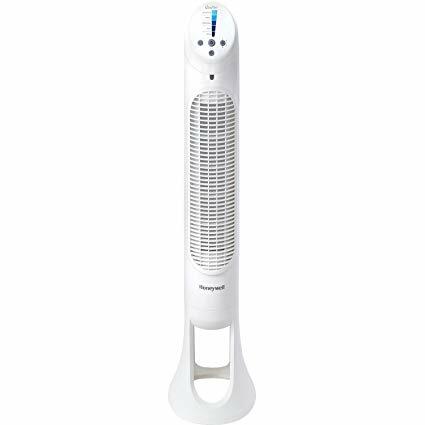 Feel a refreshing breeze in your bedroom with this great tower fan from Honeywell. The specs on this tower fan make it the perfect addition for your bedroom. You don’t need to worry about falling asleep with this unit as all of its settings are extremely quiet. The Honeywell Fresh Breeze gives you the convenience of a programmable thermostat, so you can fall asleep and not worry about turning off your fan in the middle of the night. You also have the ease of using the remote control from your bed so you can stay tucked in tight. Convenient, easy to use: Control the fan with the easy remote from your bed. Programmable thermostat: Three settings and auto shut so you can sleep in peace. Breeze mode: The breeze mode makes you feel like you’re experiencing a cool, light breeze in your room. Small design: Some may find this fan too small. To cool off a more open space like a living room, you’ll need a fan that is big and powerful enough to circulate the cold air. The Vornado is the best choice for the job because of it’s towering design and airflow technology. The fan is made with contoured blades that allow the air to reach a wide span without actually oscillating. The V-circulation technology means that the fan is constantly working to circulate the air in the entire room, keeping it at a comfortable temperature. You also can choose from about 4 different settings and there are 4 different timer settings so you don’t have to manually turn it off. Wide span circulation: The fans V-circulation technology fills an entire room with cool air. Energy-efficient: With four different timer settings, you can save energy with the auto shut feature. Difficult to clean: Many users reported the fan was difficult to clean. No one wants a fan that is so loud that it’s distracting. Honeywell has created the perfect tower fan that is so incredibly quiet it’s hard to know that it’s on. Compared to all of the other models, the QuietSet feature on this Honeywell fan proved to be silent even on the highest settings. In addition to that, the fan does a great job of circulating the air in a room so you can stay comfortable and cool. Silent: This fan proved to be the quietest out of all of them. Cools off a large area: The fans oscillating features allow it to cool off a large area. Bright LED panel: The LED panel is so bright that it could be disturbing, so it may be best to cover it up. After a while, tower fans may all start to look the same, but they aren’t. There are a few characteristics to keep in mind when hunting for the best tower fan for your home. Here are some specific features and things to look for and know of. Tower fans usually offer different speed settings. It is typical for a tower fan to have at least 3 different settings: low, medium and high. From there, a fan can have up to 10 different speeds depending on the model. This is especially useful for adjusting the strength of air you want circulating in a room. There is a difference between fan speed and modes, however. Some fans come with different speed and mode settings to choose from. A mode setting may be a pre-programmed setting, like a night mode or a breeze mode like Honeywell’s Fresh Breeze has. The Breeze mode emits a constant, low-pressure airflow that is reminiscent of an outdoor breeze. Air blowing capacity is huge with tower fans because you want to make sure that your fan has the motor power and capacity to blow a lot of air. The air blowing capacity that you need greatly depends on how big the room is you’re trying to cool. If you’re just using it for a small office then a smaller size would be sufficient. However, if you’re trying to circulate air in a big living room, you’ll need a bigger, more powerful unit. How do you tell if a tower fan has adequate air blowing capacity and coverage? Unfortunately, it’s pretty hard to tell by just looking at it. Start by reading our reviews, and reading user reviews to see what type of coverage a fan may have. Typically, the smaller and shorter, the less coverage. But sometimes a smaller unit will surprise you, like the Honeywell Fresh Breeze Tower, which is pretty small but has a lot of coverage. Even if a fan has great coverage and air blowing capacity, it will be a nuisance if it’s loud when turned on. Whether you’re in the living room or in the bedroom, you don’t want to get a fan that is too loud. In general, most fans claim to be “quiet” or “silent” but some are better than others. Some tower fans are quiet only on their low settings, which means you’d only be able to sleep with it on a lower setting. If you plan to sleep or work with a tower fan in the room then a fan with a quiet setting should be a top priority. Just as there are quiet fans, there are also fans that aren’t quiet at all, so be sure to check the reviews before you buy. Some people invest in tower fans to save energy on central AC or other cooling units. If this is the case, you want to make sure your tower fan has energy efficient modes. Typically a fan that is energy efficient has a timer or some type of programmable setting that will use a minimal amount of energy. The pre-programmed timed setting is eco-friendly because it turns off the fan after an allotted amount of time so as to save energy. Another way to be energy efficient with your fan is to use it on a lower setting and the timer, so you’re consuming less energy overall. Like we’ve said, size does matter when it comes to finding the best tower fan. Perhaps you should consider the size of not only the fan itself but also the room(s) that you wish to use it in. The size of the room is important because that will determine what size fan you need. For example, if you’ll be using your tower fan in multiple large spaces with high cielings, then get a taller fan. Taller fans will be able to oscillate the air to fill up the more open, vast spaces. On the other hand, if you’re just using your fan in a bedroom or an office, you could possibly opt for a smaller fan that will work effectively while not taking up too much space. There is an entire subcategory of “short” tower fans specifically designed for compact spaces like offices or smaller bedrooms. Luckily, most manufacturers are hip to this and have created various versions of the same model. 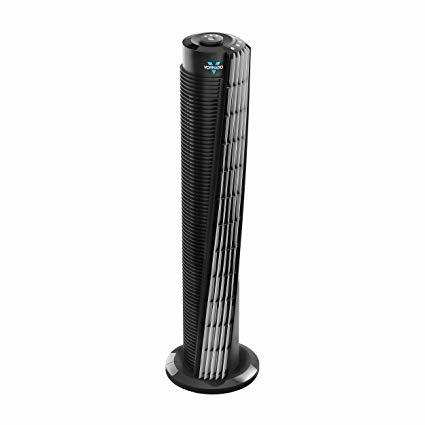 For example, the Vornado 184 Tower is also available in shorter sizes if you prefer that. Generally speaking, it’s safe to go with a medium-large sized fan if you want to have versatile use. Your new tower fan should last you years. The durability of tower fans depends on its design quality. The materials used to make the fan, the features and even the aesthetic of the tower fan. Since they are tall and slim, tower fans tend towards the unstable side of things. Some cheaper, lower quality fans will be wobbly and won’t hold up against pets, kids, or other types of accidents. This will cause the unit to fall over and possibly cause damage to your fan. It’s important to get a fan that is made with anti-slip feet so that it can remain stable on multiple surfaces. Lastly, tower fans tend to have a certain “aesthetic” to them. Nowadays manufacturers know that people want their household appliances and gadgets to match and not disrupt the decor of their home. Designs like the Dyson AM07 or even the Lasko are popular among the design- conscious. When it comes to features, the options are endless and always expanding. However, there are some non-negotiable features that you should look for to get the utmost out of your tower fan. Timer– Besides the energy saving benefits, timers make a huge difference in the tower fan user experience. There are two types of timer settings: “time-on” and “time-off”. The ‘time off’ will automatically turn off your fan for you after a set amount of time. This is perfect for when you’re sleeping, running an errand or even forget to turn off your fan. The time-on feature is great for when you want to come home to a cool house or room. You can program when you want to your fan to come on so that you don’t have to wait for a room to cool down when you get there. Remote- Believe it or not, some tower fans still come without remotes. Though it isn’t very many, we strongly encourage you to choose a fan with a remote. Being able to control the fan from wherever you are is a huge advantage and makes all the difference, especially when you’re snuggled up in bed or on the couch. From the remote, you should be able to change through all of the settings, modes, and speeds easily. There should also be an easy place to store the remote so you’re less likely to lose it. Some models have a magnetic remote that is easily placed on the top of the fan. LCD Display- The LCD display on a unit is where you’re able to choose the temperature, switch speeds and modes and use all of the other features your tower fan has. Make sure to check how bright the LCD is, especially if you’re using the tower fan in your bedroom. Some fans have an extremely bright LCD display that could be disturbing at night. Oscillation and Angling- The oscillating and angling features refer to the way the air is distributed throughout the room. Some fans have oscillating louvers which circulate the air in different directions. Oscillation usually increases comfort by circulating the air throughout the entire room instead of in one, direct line. A fan can also have angled louvers instead of oscillated louvers. In this case, the fans louvers are angled so that it effectively pushes air in different directions without actually oscillating. The type that you choose is a matter of preference. It is important to check the warranty that a manufacturer offers on any product. Accidents and malfunctions happen, and it’s a huge disappointment when you aren’t able to get support from the manufacturer of the product. We say a general rule of thumb is to look for a warranty of at least 1+ years. The more, the better. If you’ve gotten this far, we hope you feel equipped enough to choose the best tower fan for your home, bedroom, office, or wherever! Check out our picks for the best tower fans to see which one is right for you. Stay cool!